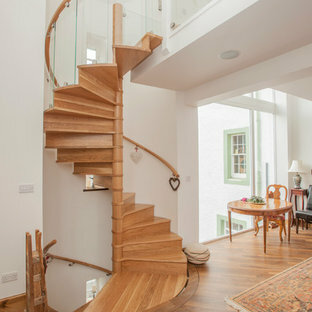 Haldane UK has designed, manufactured and supplied a bespoke American white oak spiral staircase which rose through 2 flights for the refurbishment of a manse in Scotland. 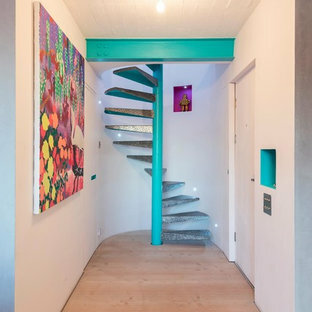 Working with sketched drawings supplied by the client, Haldane developed a solution which enabled the spiral staircase to be virtually free standing from ground floor to second floor with only fixings to each of the landing sections. 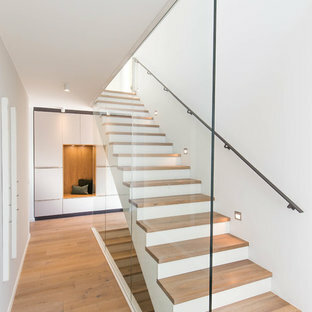 The staircase featured 32mm solid oak treads measuring 1000mm, 170mm diameter solid oak spacer components and was designed to provide a 20mm clear space from the treads to the wall. 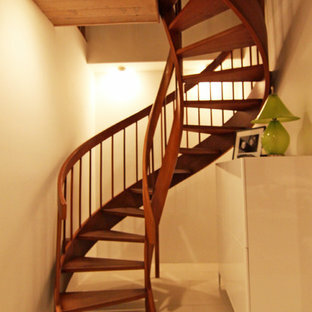 Haldane also manufactured and supplied 10.5 linear metres of 60x50mm elliptical spiral handrail which was fixed to the wall via brackets and finished with a bull nose end. 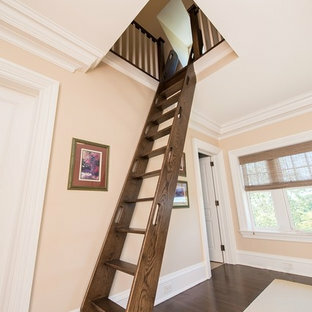 This remodel of a two-unit Victorian in the client's family for years was approached with both care and vigor. 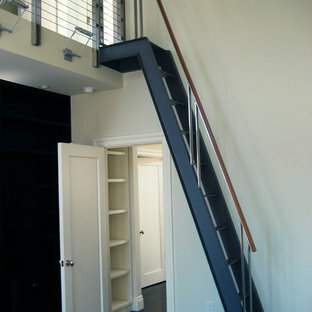 The project brief was to expand the upper unit into the attic, adding views of the Golden Gate bridge. 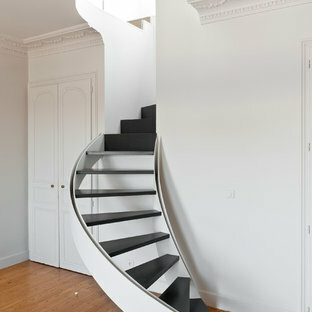 The facade was meticulously refurbished. The essential logic of discrete Victorian rooms, retained but reimagined, becomes progressively more modern higher in the building. Materials include a custom lightweight concrete sink and soaking tub, Calacatta marble, mahogany cabinets and stainless steel railings. 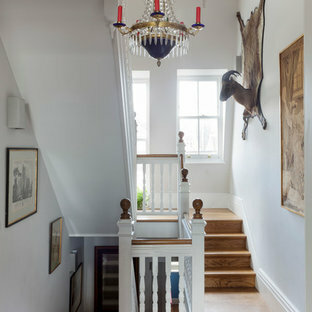 When the front door opens - this is a wow. 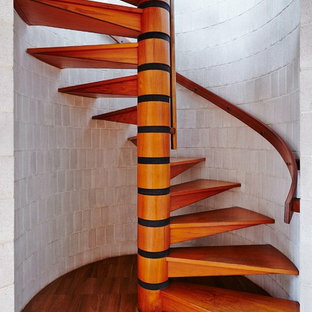 This lovely spiral acts as a design anchor in this nautically designed beachfront cottage. 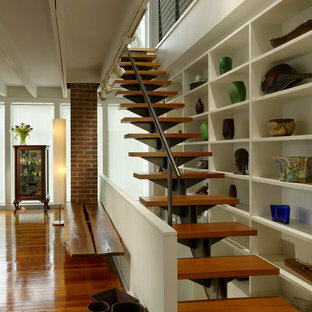 Wave pattern treads and bronzed balustrade and metalwork complete the look. 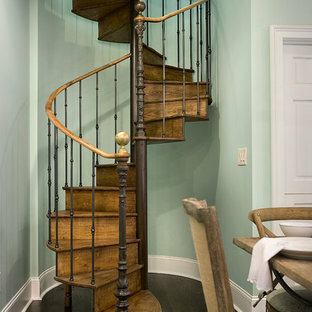 The stair provides access to the guest quarters and suite making the journey and memory of this place just that much more dramatic.